HISTORY: The heart of Barcelona is located here. 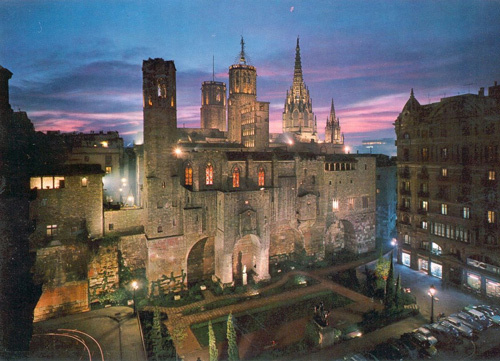 The medieval city was built here on top of the Roman ‘Barcino’ whose ruins can be visited underneath San Jaume Square. From the year 2000 this square has housed the political insitutions of Barcelona and is today home to Barcelona’s council and the Catalan government buildings. The Cathedral of the Seu, with its gothic style, is just behind this square: it was built upon ruins dating from the early Christian period. For the Olympic Games in 1992, this area was renovated and is today one of the most touristic parts of Barcelona. ATMOSPHERE: This is a very distinct area, as it has its own personality! The Barri Gótic is a feast for the senses; a mix of smells, colours, foods, ethnicities, music & people. The apartments in Barri Gotic Barcelona offer a view over the constantly changing scenes and countless winding streets, shaping the picturesque image of the famous district. PLACES: Las Ramblas, the tree lined avenue which runs from Plaza Catalunya down to the sea by the statue of Columbus. It offers street artists/ statues, flower stalls, kiosks and many more... No matter if it´s day or night, summer or winter this avenue is always the centre of all sorts of exciting activities. A tourist place without a doubt but a must-see for everyone nonetheless. The Boquería market located off Las Ramblas is well worth a visit for its interesting architecture and its extraordinary offers of fresh products such as fruit, dairy, fish, meat, as well as some delicious fresh fruit juices. Just off Las Ramblas you will find a beautiful square called ‘Plaza Real’. It is one of the prettiest parts of Barcelona with its buildings lining the perimeter of the square, its arcade, palm trees and beautiful street lamps designed by Gaudí. Here you can spend some time enjoying a relaxing drink or meal in one of the bars and restaurants lining the square. In the evening you can also check some of the near night clubs like Tarantos. Lose yourself in the labyrinth of streets & visit the pretty squares in this area: Plaza del Pi, Plaza Sant Felipe Neri, Plaza George Orwell and Plaza Sant Jaume. Last but not least the Cathedral of Santa Eulalia (La Seu), is well worth a visit, with its neo-gothic façade and cloister with 13 geese in memory of the 13 years of martyrdom and 13 tortures. Are you looking for apartments Barcelona Gothic? Find your apartment Barcelona on our map.